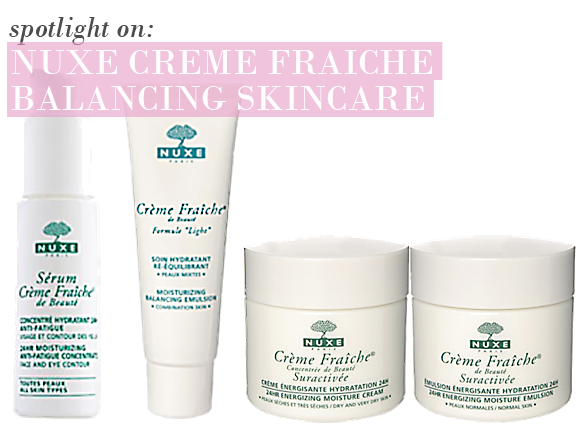 The Nuxe Crème Fraiche Hydrating 24 Hour Care capsule collection of rehydrating products is perfect if you’re suffering from a bit of the summer dehydration I mentioned yesterday. Each product contails a mindboggling 8 plant milks and 4 essential oils to really boost the level of moisture in your skin, making it plump and supple. The collection includes four products, each designed to target a different skin type. These products tackle dehydration problems, working to regulate moisture levels and make skin more manageable. This lightweight serum delivers the perfect level of moisture for all skin types, and is particularly good for the keeping the eye contour hydrated and energised. The combination of eight plant milks and four essential oils really works wonders for the suppleness of the skin, helping to build up a moisture reserve by diffusing water through the many layers of the skin. The texture is that of a milk-serum, which helps the formulation to penetrate the dermis more intensively. Use this underneath any of the other products for an extra boost of nutrients. Even the oiliest of skin could have an underlying lack of moisture. This is a wonder product for combination skin in particular, working to deeply nourish and hydrate dry areas, whilst rebalancing and mattifying oilier patches. The formulation also works to correct skin imperfections, minimising blemishes and a blotchy complexion, whilst also tightening pores to regulate sebum production. The feel of this lotion on the skin is so refreshing and light; it’s truly gorgeous as a makeup base. The highest concentration of moisturising ingredients for very dry skin. This honey and essential oil enriched formulation makes for long-lasting and intensive hydration all day, helping skin to regain a level of comfort, suppleness and radiance that lasts. Although the formulation is rich, it’s not uncomfortable or greasy – I applied the Concentree de Beaute, and went to a mirror to check its progress and it had already melted completely into the skin. It must be thirsty! This cream really is energising, utilising antioxidant pomegranate as the key ingredient. The skin looks and feels radiant and supremely moisturised, a feeling that lasts for a phenomenal 24 Hours. The texture of this one is less thick than the Concentree de Beaute; it feels more whipped and lightweight, with a really comfortable texture on the skin. This is perfect for day to day wear if your skin isn’t overly oily, and isn’t painfully dry. It's an amazing product. Beautiful formula - non greasy texture, moisturise and nourishes the skin but has a matt finish. Great make-up base. Smells lovely also. Love it! This entry was posted on Wednesday, June 29th, 2011 at 8:00 am and is filed under Skincare, Spotlight On. You can follow any responses to this entry through the RSS 2.0 feed. You can skip to the end and leave a response. Pinging is currently not allowed.